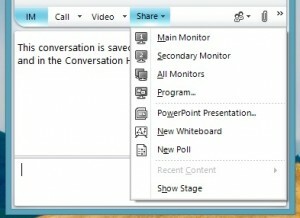 Microsoft Lync for Office 365 is Microsoft’s replacement for Office Communicator. It is very similar in a lot of respects, but it ties in tightly with the Office 365 platform and has some upgraded feature sets over its predecessor. At its most basic level, Lync is an instant messaging client. It allows you to chat with anyone else in your organization that has Lync via text. It ties in your Office 365 organization contacts so that you have immediate access to chat with the same people you have in your address list from your organization who are on Lync. On top of this, it also allows you to see the real time status of other users, whether it be available, away, busy, in a phone call, do not disturb, be right back, or off work. It also allows for location sharing so people can see if you are signed on from custom locations. For example, I would probably have “Home”, “Office,” and “Laptop” attached to my Lync. Next it allows for audio and video calls and conferencing. You can call anyone on your contacts list and chat with them either just over audio or over webcam. You can also conference other people into your audio calls by just dragging and dropping them in. This can be done on individuals or entire groups of people. The phone will start ringing on their end and they can join up to your call. Lync can also do meetings, either scheduled or on the fly. Invite in the users you want, and then you can make use of another great feature – the whiteboard. Here you can allow all your meeting participants to view and manipulate a shared space. For example you could import an image and then use basic editing tools to manipulate or draw on it while it is shared in real time with all the meeting’s participants. It doesn’t have to be a whiteboard though – desktop sharing is available as well. Other nice meeting features include creating polls, distributing files, running a powerpoint presentation, and sharing a specific program (rather than your desktop). You can also invite outsiders or people without Lync installed to Lync meetings via the web app. 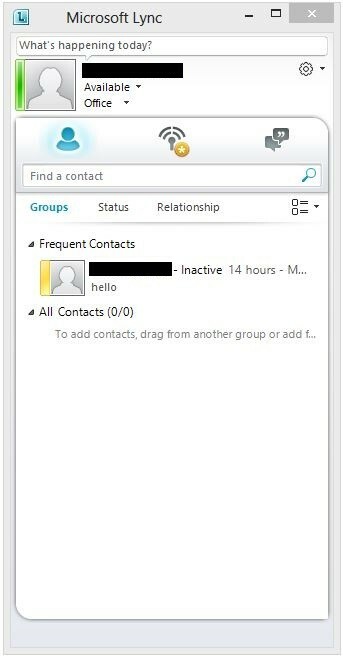 One of its final but possibly most important features (to some organizations) is Lync to Phone. 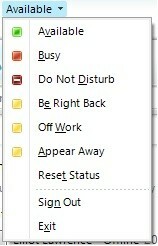 This basically turns Lync into a full VOIP client. This won’t be for everyone as it requires a higher level Lync subscription plan, you have to subscribe to a phone provider to use it, and since it would probably be used to replace your current phone or VOIP provider/system/setup. Microsoft provides a partner list for phone providers at the bottom of this page. However, it has many advantages. Lync to phone allows you to make calls to all phone numbers (not just other Lync users in your organization) as well as attach a phone number to Lync so anyone can call you. 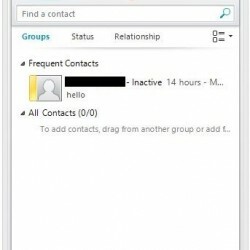 This allows you to make calls from any computer with Lync and you can easily click to call contacts within Outlook and other external programs. It integrates with smartphones so that work calls can be received and made from your smartphone (using your office number) and you can transfer your calls to your smartphone mid-call. You can allow others to make and receive calls on your behalf, as well as get voicemail and voicemail transcription through Exchange Online voice mail. Most of these are features that can be had via other services or VOIP providers, but if your organization is already a heavy user of Lync for Office 365, it can be extremely convenient to have it all integrated into one platform. There are quite a few features tied into the whole Lync platform, and while I can name them all individually the nice thing is that they can often be tied together and used in combination. You could use whiteboard in just a normal text chat meeting, or you could use it in an audio or video call as well. So on the whole, Lync is Microsoft’s new communication application that ties together text, audio, video, contacts, VOIP, meetings, whiteboards, desktop sharing, current status, smartphones, Outlook, contacts, and Office 365. While most of these features can be had elsewhere from other services, heavy Office 365 users and large organizations will find the integration and mobility (all in the cloud – no central server) of this platform to be very convenient.